Look for several Cadillac mascot prints we have on this site. 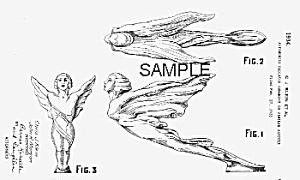 This wonderful reproduction of the original patent graphic is crisply printed on luxurious Ivory Parchment Paper. It includes a white acid-free matte and is ready for insertion into a standard 8" x 10" frame for hanging. Graphic area shown is 4 1/2" x 6 1/2". Also, included are the remaining pages of the Patent Document printed on 20# white bond paper to complete the Patent information for the collector.